When you need extra storage on the bike, you take it where you can get it. That's why we designed our Top Tube Pack to be a small, out-of-the-way solution for carrying your smaller ride essentials and gear. When you need extra storage on the bike, you take it where you can get it. That's why we designed our Top Tube Pack to be a small, out-of-the-way solution for carrying your smaller ride essentials and gear. It features a nylon-coated mesh construction that's weather-resistant in order to keep the bag's contents safe and dry, which is further amplified by the weather-resistant YKK zipper at the exterior. And to make it easy to get on and off the bike, it has a simple-to-use, three-point Velcro® attachment system. This makes it easy to swap between bikes, or to take off if you're locking up your bike outside for an extended period of time. At the interior, you'll find a seven-liter storage capacity that's ample enough for some larger items like a camera, pumps, or extra water, yet small enough that small items don't disappear like they've fallen into a black hole. Weather-resistant YKK zipper prevents water seepage in wet conditions, keeping the bag's contents dry and protected. 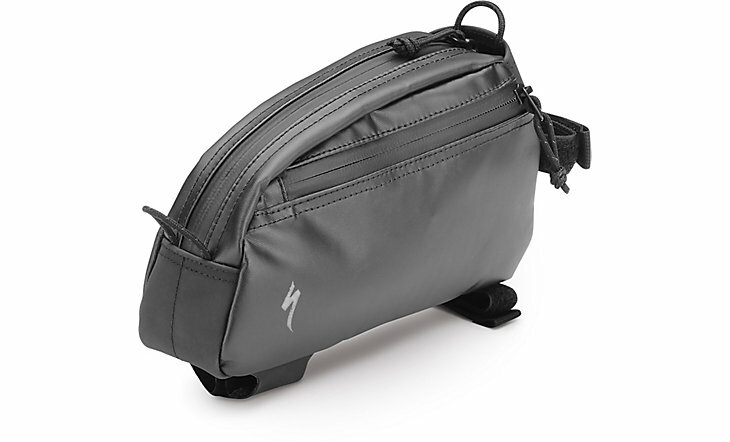 Quick access side pocket allows safe, easy access for your smaller items. Secure three-point Velcro® attachment makes for simple installation and removal.